INTO THE DUNGEON WITH YOU! First, turn off your ST. Turn on a lamp. Open the package and take out the instruction booklet. Read the short history of the adventure on which you're about to embark. Now take a deep breath. Go around the house gathering supplies you'll need: scratch paper, grid paper, pencils, rulers, blank disks, blankets--and food and water for eight hours. Ready? Then put the disk in your drive, turn on your ST and be prepared to shed every preconception you ever had about computer games. This is Dungeon Master. An iron door creaks open. The halls of the dungeon lie before you: ominous, dank, beckoning. Rest your hand comfortably over the mouse and use it to steer your path by clicking on the arrows. Your perspective is three-dimensional. You can turn right or left to examine the stone walls as you pass them. As you enter and start down the passageway you turn back for one last look of the outside world. The door has closed behind you. No matter how much your characters' skills increase, never forget that they are not indestructible. Here lies a pile of bones of a champion who may not have been quite ready for battle; I hope an Altar of Rebirth is nearby to restore her to life. You enter the Hall of Champions and see mirrors on the walls. These contain the imprisoned souls of 24 dungeon explorers from which you select four to form your party. You are a guiding spirit, a non-entity. You will control your party's actions and movements, yet be invisible to them. Using your champions as your eyes and hands, your destination is the lowest depths in the dungeon in search of the firestaff, which has fallen into the hands of the dark lord Chaos. You examine each of the champions by clicking on his or her mirror and then clicking on the eye. Each champion's picture, skills, strengths and possessions convey more than just his or her chances against dungeon monsters; they also give a hint of personality that you will take into account when selecting your party. As you move, your surroundings start to seem almost comfortable. You build your party and experiment with their possessions. You use the party leader's hand to pick items up, move them about and examine them. 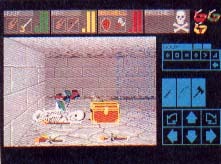 On the right side of the screen you see the controls for wielding weapons and casting spells. Cast aside your keyboard: you control your Dungeon Master characters completely with the mouse. Your actions in Dungeon Master take place in real time. Monsters will move about, stalk you or wander off no matter whether your characters are fighting, resting or moving. As you progress you find objects on the floor and in hidden nooks and crannies in the walls. You pick them up, examine them, and start filling your champions' backpacks with food, water, weapons, keys, torches, scrolls. Each object has different qualities, just as each champion has different skills. Often, how you use an object depends on the skill of the champion holding it; an experienced fighter for example, can chop or melee an ax, while another character will only be able to swing it. As you get used to the kinds of puzzles in the dungeon, you will get more experienced in finding your way about and mapping your path. Your characters also will gain experience and increase skills. Their strength and health will increase, as will their levels of the important magical element Mana. The dungeon also changes. As you go deeper into the dungeon the monsters will become meaner, food and water will become harder to find, puzzles will become more difficult to solve and the hidden switches and levers in the walls will grow smaller. Your chances to stop and rest will also decrease, and the space in your backpacks will be more and more valuable. You'll have to make judgments about what items to leave behind, most times without knowing the value of your weapons in fighting the unknown beasts that lie before you. And sometimes the most innocuous object can be indispensible in solving a riddle further on. As you go deeper into the dungeon, the monsters become meaner--and harder to kill. 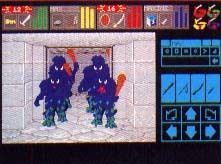 By the time you reach level ten, you may find yourself reflecting that these blue guys from level two were really quite friendly types. Reorganizing supplies sometimes helps; using up torches and eating food may give you room to carry other things. But you may find that while you have room in your packs to carry everything, your characters simply aren't strong enough. At those times you start compulsively working to build up your characters' strengths. You stop thinking of monsters as threats; you hunt them down instead for target practice. Many of the creatures are magical, and casting spells at them is as effective as fighting with swords and daggers. You come across scrolls which often suggest new spells that will help you. Protection spells and potions will also aid you well, so practicing them is a good investment of time. Suddenly you realize you are thinking, acting and experimenting within the logic of the game. You are no longer aware that the mouse on your desk is in between your hand and the hand on the screen. I wasn't kidding about the eight-hour food supply. It can take weeks to finish a single Dungeon Master game. When you're finished, you might want to start over and select new champions with different attributes, now that you know what's down there. But if you ever do get tired of trudging around the same old dungeon, never fear. By the time you read this, FTL will probably have released a mini-adventure that you can load in using the Dungeon Master disk. This is planned to have up to three additional levels with its own goal and puzzles to solve. Additionally, FTL is working on a new adventure game. The Dungeon Master source code was specifically written to make it easily modifiable to other scenarios, so this game won't take nearly as long to be released. The new game setting most likely won't be another dungeon; possibilities include a mystery, science fiction or haunted house setting. But in the meantime, if there's any consolation to having your life taken over by Dungeon Master, it's that you are not alone. Dungeon Master is a true video game phenomenon. In its first five months of distribution Dungeon Master sales far exceeded sales of FTLs Sundog in the same time period--and Sundog was the bestselling ST game for a year. CSS, a major ST software distibutor, has listed Dungeon Master on its Top Twenty list since it came out. At presstime (except for one week), Dungeon Master had been number one in the European Gallup poll of ST software sales since it was released in March. Almost every major online service has tips and hints from other players; you can often download maps and lists of spells. On CompuServe, the Dungeon Master thread is the single longest discussion on the entire service, so if you get really stuck you can always log on; you could, that is, if you hadn't formatted your Flash disk to save a game. Sure, tell your friends about Dungeon Master--just don't be too enthusiastic. That would make them want to come over to try it out. And you know what that means. It might be weeks before you get another shot at conquering Lord Chaos. Dungeon Master, $39.95. FTL Games, PO. Box 112489, San Diego, CA 92111. (619) 453-5711.